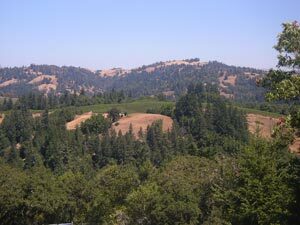 This 70-acre site is located in the headwaters of the South Fork Gualala River on a former organic vegetable farm. Vineyards, which occupy less than half of the site, are managed with no-till methods and extensive drainage improvements to conserve soil and avoid erosion. See also Waters Ranch in Suisun Creek watershed.